Choice, Flexibility and Scale OR Confusion, Complexity and Sprawl? One thing was obvious at VMworld Europe this year, the amount of solutions based on end to end pre-defined architectures was staggering. Converged Infrastructure (CI) has never been so high on the agenda but with the announcement of EVO:RAIL CI now on the lips of everyone from C-Level execs to the Joe Admin at the coal face. This was a real eye opener for me personally. I have spent the last 4 to 5 years on booths trying to explain to people what CI is and why its not just a ‘marking’ play. (though some CI is just that). To have most people come to the VCE booth this year already with the concepts behind CI in their heads and how it can benefit their business was fantastic and allowed for real solution focused conversations. This was the moment that really showed me that CI here to stay and is how companies will deploy their infrastructure in the future. Pretty much everyone that came to the booth had a similar message from walking the floor though. “Every vendor is saying they have THE ANSWER, but not just one answer they have several, im so confused”. After walking the floor and knowing the CI and wider industry how I do, i cant say i blame them. There is so much choice that people are stuck seeing trees but missing the wood. Autonomy and Freedom of choice are critical to our well being, and choice is critical to freedom and autonomy. Nonetheless, though modern Americans have more choice than any group of people ever has before, and thus, presumably, more freedom and autonomy, we don’t seem to be benefiting from it psychologically. This really does ring true with the current state of the industry IMO. CI is bad enough right now as a competitive space with different ways to cut the cake, but add in all the IaaS, PaaS, SDN, SNS, 3rd platform this and that etc that everyone and their dog are offing a layer on the cake and you have a critical mass of confusion. Even vendors that offer a single 2u CI offering are bundling in everything under the sun as standard and then some more on top as options. How companies approach support, operate, maintenance, upgrades, patchs etc etc when faced with such complexity is without doubt the challenge. Speeds and feeds along with general capability are obviously important but even if you treat the tin as commodity those soft issues are not to be shirked and are the main concern at large enterprises and SPs, especially at the C-Level. One of the benefits of going CI is simplicity both from a tin/software perspective but also from a high level ops view. I’m always honest with people I talk to. If, for example, you want the latest Haswell Chip the day after a Cisco GAs it then VCE and Vblock may not be for you as it undermines the values of Vblock and increases the risk. Not every version of every product from the VCE investor companies (yes Cisco is still and investor before anyone things of a cheeky comment) can be integrated as we would be testing for in an infinite loop and never release a product. So we streamline those choices while trying not to impede on that autonomy and freedom that choice brings. The market in general is in a state of flux. No one quite knows what the future will hold. Its becoming quite obvious (to me at least) that the whole world will not be dominated by the likes of AWS and Azure anytime soon (perhaps when my son starts work it will be, he’s 6 btw). So there will undoubtedly be some natural thinning in the marketplace i feel in the near to mid future. Bets are being hedged and people are starting to make decisions but in my humble opinion companies will be struggling with Confusion, Complexity and vendor Sprawl for some time to come. Obviously, i think im work for a company with the right approach. But this is not a sales post, just a general observation of the market and the complexity companies are facing on a day to day basis. An of advantage of Vblock using Panduit as its cabinet supplier means the custom cabinet and cable management components that Panduit supply to VCE allows for optimal space and cable management based around a set exacting standards. It allows for maximum efficiency when building out the physical components into the cabinets. However, there are sometimes DC requirements that go beyond what is a standard option within the Vblock configuration. Being that Panduit don’t just supply cabinets but a whole range of DC options means that VCE can meet almost any DC requirement no matter how demanding. One of my customers who use a Colo DC required that the Vblock must be supplied and fit into a cold aisle containment row. The DC did have a supplier for their default cabinet cold aisle containment but unfortunately that company had gone out of business. We deployed the Panduit Net-Contain Containment System. Panduit and VCE worked together to scope and deploy the Vblock and Cold Aisle Containment system. Those familiar with VMAX with know that its mandatory to use EMC cabinets are are actually a different height from the Panduit cabinets used in the rest of the Vblock. Panduit produced custom built panels at the top of the VMAX Titan racks to fill the void and ensure non of the cold air escaped. Floor panels designated for expansion are also covered with floor to roof blanking panels which are easily removable. I recently came across a customer that had limited space, power and cooling in there datacentre (very few who don’t right?) but wanted to put in a Vblock but to do so would need to split most of the UCS chassis across multiple racks and at opposing ends of the datahall. 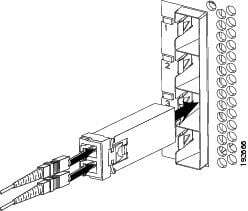 Traditionally, when I design and spec a UCS system I use the default ‘passive‘ Copper Twinax SFP+. In the event I need to provide cabling for Fabric Interconnects that are more that 5 meters away from the chassis then I would use ‘active‘ Copper Twinax SFP+ as these can go up to 10 meters. But in this case the distances are over 30 meters. The alternative is go optical by using SFP+ modules (SFP-H10GB-SR) which can more than compensate for almost any datacentre distances (300m or so). A few of you may have noticed I said this was a Vblock, you may be thinking you will not be aloud to do this with a Vblock as it brakes the default spec. While it does go against what’s in the design for a Vblock, it is a great example of how the Vblock products are actually flexible and not as rigid a people may think and exceptions can be raised when genuine requirements demand it. Click here for more info on installing and configuring a UCS chassis and cabling it up. Thanks to a Andrew Sharrock (@AndrewSharrock) for pointing this one out. As of UCS Software release 1.4 Fabric Extender Transceivers have been supported and are an alternative to using the above. You can get up to 100m from a FET and it supports OM2, 3 and 4 cables. I have a feeling not many people have deployed this as its Google doesn’t bring many results back on this subject but its an option. I’m not sure if VCE support it within a Vblock either (VCE peeps are welcome to confirm or deny this in the comments). Step 1 Remove the copper Twinax SFP+ from the I/O module port by pulling gently on the rubber loop (see Figure 2-19). The cable and SFP+ transceiver come out as a single unit, leaving the I/O module port empty. Step 2 Insert the optical SFP+ transceiver into the I/O module port. Make sure that it clicks firmly into place. 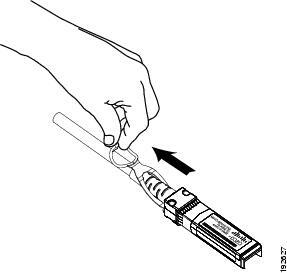 Step 3 Plug the fiber optic cable into the optical SFP+ transceiver (see Figure 2-20).